Naiyyayika scholars approached philosophy as a form of direct realism, stating that anything that really exists is in principle humanly knowable. To them, correct knowledge and understanding is different from simple, reflexive cognition; it requires Anuvyavasaya (अनुव्यवसाय, cross-examination of cognition, reflective cognition of what one thinks one knows). An influential collection of texts on logic and reason is the Nyayasutras, attributed to Aksapada Gautama, variously estimated to have been composed between 6th-century BCE and 2nd-century CE. The most important contribution made by the Nyaya school to Hindu thought has been its treatises on epistemology and system of logic that, subsequently, has been adopted by the majority of the other Indian schools. The Naiyyayika maintains two modes or stages in perception. The first is called nirvikalpa (indeterminate), when one just perceives an object without being able to know its features, and the second savikalpa (determinate), when one is able to clearly know an object. All laukika and alaukika pratyakshas are savikalpa, but it is necessarily preceded by an earlier stage when it is indeterminate. Vātsāyana says that if an object is perceived with its name we have determinate perception but if it is perceived without a name, we have indeterminate perception. Jayanta Bhatta says that indeterminate perception apprehends substance, qualities and actions and universals as separate and indistinct something and also it does not have any association with name, while determinate perception aprrehends all these together with a name. There is yet another stage called Pratyabhijñā, when one is able to re-recognise something on the basis of memory. Upamāna (उपमान) means comparison and analogy. Upamana, states Lochtefeld, may be explained with the example of a traveller who has never visited lands or islands with endemic population of wildlife. He or she is told, by someone who has been there, that in those lands you see an animal that sort of looks like a cow, grazes like cow but is different from a cow in such and such way. Such use of analogy and comparison is, state the Indian epistemologists, a valid means of conditional knowledge, as it helps the traveller identify the new animal later. The subject of comparison is formally called upameyam, the object of comparison is called upamānam, while the attribute(s) are identified as sāmānya. Thus, explains Monier Williams, if a boy says "her face is like the moon in charmingness", "her face" is upameyam, the moon is upamānam, and charmingness is sāmānya. The 7th century text Bhaṭṭikāvya in verses 10.28 through 10.63 discusses many types of comparisons and analogies, identifying when this epistemic method is more useful and reliable, and when it is not. 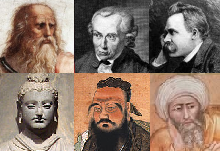 In various ancient and medieval texts of Hinduism, 32 types of Upamāna and their value in epistemology are debated. Each school of Hinduism has its own treatises on epistemology, with different number of Pramanas. For example, compared to Nyaya school's four pramanas, Carvaka school has just one (perception), while Advaita Vedanta school recognizes six means to reliable knowledge. The earliest text of the Nyāya School is the Nyāya Sūtra of Akṣapāda Gautama. The text is divided into five books, each having two sections. <i lang="sa-Latn" title="International Alphabet of Sanskrit transliteration">Vātsāyana</i>'s Nyāya Bhāṣya is a classic commentary on the Nyāya Sūtra. Udyotakara's Nyāya Vārttika (6th century CE) is written to defend Vātsāyana against the attacks made by Dignāga. Vācaspati Miśra's Nyāyavārttikatātparyaṭīkā (9th century CE) is the next major exposition of this school. Two other texts, Nyāyaṣūcinibandha and Nyāyasūtraddhāra are also attributed to him. Udayana's (984 CE) Nyāyatātparyapariśuddhi is an important commentary on Vācaspati's treatise. His Nyāyakusumāñjali is the first systematic account of theistic Nyāya. His other works include Ātmatattvaviveka, Kiraṇāvali and Nyāyapariśiṣṭa. Jayanta Bhatta's Nyāyamañjari (10th century CE) is basically an independent work. Bhāsavarajña's Nyāyasāra (10th century CE) is a survey of Nyāya philosophy. Gangeśa Upādhyāya's Tattvacintāmaṇi (12th century CE) is the first major treatise of the new school of Navya-Nyāya. His son, Vardhamāna Upādhyāya's Nyāyanibandhaprakāśa (1225 CE), though a commentary on Udayana's Nyāyatātparyapariśuddhi, incorporated his father's views. Jayadeva wrote a commentary on Tattvacintāmaṇi known as Āloka (13th century CE). Vāsudeva Sārvabhauma's Tattvacintāmaṇivyākhyā (16th century CE) is first great work of Navadvipa school of Navya-Nyāya. Raghunātha Śiromaṇi's Tattvacintāmaṇidīdhiti and Padārthakhaṇḍana are the next important works of this school. <i lang="sa-Latn" title="International Alphabet of Sanskrit transliteration">Viśvanatha</i>'s Nyāyasūtravṛtti (17th century CE) is also a notable work. The Commentaries on Tattvacintāmaṇidīdhiti by Jagadish Tarkalankar (17th century CE) and Gadadhar Bhattacharya (17th century CE) are the last two notable works of this school. "It is significant that the name logic is etymologically connected with the Greek god logos, which denotes both 'thought' and 'word' or 'discourse'. The significance of this etymological connection can be adequately appreciated if it is remembered that logic, in its rise and development in the western world, particularly in Greece, was closely connected with rhetoric. Thus the name logic is of a tell-tale character in its application to logic in the West ; and it may be taken to indicate how, almost from its very rise, western logic found, itself in the firm grip of formalism and how it took more than twenty centuries for the scientific method underlying Aristotle's Organon to be redeemed, brought into prominence and implemented in the Novum Organum of Francis Bacon (1561-1626). The term logic should not be taken to carry with it all these implications of European history when it is used in the phrase Indian logic." The central concern of Indian logic as founded in Nyāya is epistemology, or the theory of knowledge. Thus Indian logic is not concerned merely with making arguments in formal mathematics rigorous and precise, but attends to the much larger issue of providing rigour to the arguments encountered in natural sciences (including mathematics, which in Indian tradition has the attributes of a natural science and not that of a collection of context free formal statements), and in philosophical discourse. Inference in Indian logic is ‘deductive and inductive’, ‘formal as well as material’. In essence, it is the method of scientific enquiry. Indian ‘formal logic’ is thus not ‘formal’, in the sense generally understood: in Indian logic ‘form’ cannot be entirely separated from ‘content’. In fact, great care is exercised to exclude from logical discourse terms, which have no referential content. No statement, which is known to be false, is admitted as a premise in a valid argument. Thus, the ‘method of indirect proof’ (reductio ad absurdum) is not accepted as a valid method−neither in Indian philosophy nor in Indian mathematics−for proving the existence of an entity whose existence is not demonstrable (even in principle) by other (direct) means of proof. Indian logic does not make any attempt to develop a purely symbolic and content independent or ‘formal language’ as the vehicle of logical analysis. Instead, what Indian logic, especially in its later phase of Navya-Nyāya starting with the work of Gāngeśa Upādhyāya of 14th century, has developed is a technical language, which is based on the natural language Sanskrit, yet avoids ‘inexactness’ and ‘misleading irregularities’ by various technical devices. This technical language, being based on the natural language Sanskrit, inherits a certain natural structure and interpretation, and sensitivity to the context of enquiry. On the other hand, the symbolic formal systems of Western logic, though considerably influenced in their structure (say, in quantification, etc.) by the basic patterns discernible in European languages, are professedly purely symbolic, carrying no interpretation whatsoever−such interpretations are supposed to be supplied separately in the specific context of the particular field of enquiry ‘employing’ the symbolic formal system. ^ a b David Christian (1 September 2011). Maps of Time: An Introduction to Big History. University of California Press. pp. 18–. ISBN 978-0-520-95067-2. ^ Kuppuswami Sastri, S. (1951). A Primer Of Indian Logic. Osmania University, Digital Library Of India. The Kuppuswami Sastri Research Institute. ^ Matilal, Bimal Krishna. "Indian Approach to Logic" (PDF). cpsindia.org. Retrieved 2019-01-14. "Nyaya". Internet Encyclopedia of Philosophy.